Founded in 1993, the NECBL began its direction under Cincinnati Reds and New York Mets All-Star and Major League Baseball home run leader, and Emmy Award-winning television producer/director Joseph Consentino. Play started in 1994 and today the NECBL has become a strong twelve-team league that plays in all six New England states. It recruits players attending U.S. colleges from New England, the other 44 states, and foreign countries, provided that they come from NCAA-sanctioned colleges or universities, are in good academic standing, have completed at least one year of athletic eligibility, and have at least one year of eligibility remaining. 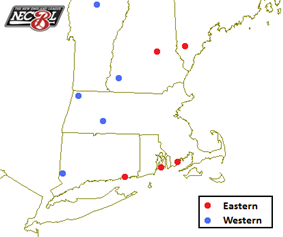 The NECBL became a 13-team league in 2013 with the addition of teams in Rhode Island (Ocean State Waves), Massachusetts (Plymouth Pilgrims) and New York (Saratoga Brigade) (the league's first team to operate outside New England), but reverted to 12 teams after the Brigade folded. Rhode Island Gulls Cranston, RI Cranston Stadium 4,500 1998–2000 Became the Newport Gulls. For the current season, the league is divided into two six-team divisions, the North Division and the South Division. During the regular season, teams play in-division opponents a total of six times, three games at home and three away. Teams play out-of-division opponents twice, one game at home and one away. These games make up the 42 game regular season schedule. When doubleheaders are scheduled due to inclement weather, NECBL rules dictate that they are two seven-inning games. NECBL regular season games have 2 umpires, while All-Star and playoff games have 3 or 4 umpires. The top four teams from each division qualify for the playoffs. In the division semifinal round the first seeds play the fourth seeds and the second seeds play the third seeds, respectively, in best-of-three series. The winners of the division semifinals advance to the division finals, where they play a best-of-three series against their fellow division finalist. The division champions advance to the NECBL championship series, where they face each other in a best-of-three series to decide the NECBL champion. In the NECBL's history, the most successful team is the Newport Gulls, with six league championships and ten championship series appearances. The defunct North Shore Navigators franchise had four league titles. The Keene Swamp Bats have four. Three franchises have won two championships, the Sanford Mainers, the Vermont Mountaineers, and the defunct Central Mass Collegians. The Mystic Schooners have won one championship, when the team was known as the Eastern Tides in the league's inaugural 1994 season. The following former NECBL players have gone on to play in Major League Baseball. Former NECBL players have reached the major league rosters of 29 of 30 MLB teams, with the Philadelphia Phillies being the only team for which a league alumnus has yet to appear. All NECBL games are broadcast online through the NECBL Broadcast Network, with Teamline providing both audio, for all games, and video, for select games.